Holiday is approaching and if you are having traveling plan and don’t intend to bring your bulky laptop together but still prefer to view all your favorite bookmark while on the move, this is quite a good software utility that you can consider. 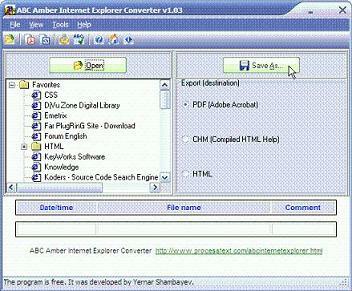 Named as ABC Amber Internet Explorer Converter v1.03, it will convert all your favorite bookmarks and save them into a nicely consolidated format such as PDF, CHM or HTML that can be further stored in thumb drive to be brought everywhere whenever you like. The software utility consumes around 1.1MB and can be easily installed in any Windows PC where you normally work on. Once after installation and launched, the software will be able to detect all your favorite bookmarks that stored on your computer and create an easy viewing page with all the webpage links that when clicking on it will bring users to your favorite websites as long as internet access permits. Depending on the preferred format that you like, users can choose to save them in PDF (Adobe Acrobat), CHM (Compiled HTML Help) or HTML standard. This is quite useful to ensure that you can access to your favorite websites or when trying to share all your bookmarked websites to your friends. However, too bad that it only works with Internet Explorer but not other famous web browsers such as Mozilla Firefox, Google Chrome or etc. If you need it, just download it here free of charge.